The Aberration Count Distribution network is opened from the menu of the main window. 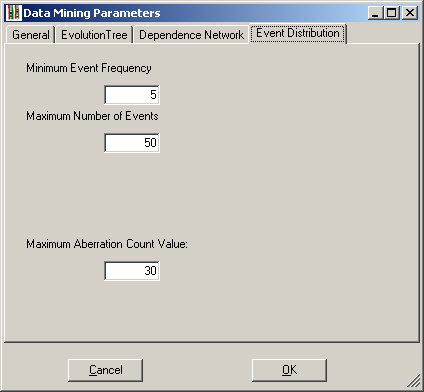 Select "Mine - AberrationCount Distribution" from its menu. There upon the distribution window is opened, but the dependence network is not yet calculated. You may edit the parameters first. To show the dependence network, select "Show - Graphics" from the menu. The dependence network is calculated and shown in the window, with the most frequent rearrangement being selected. From the combobox "Select Event", the event to be shown can be selected. Events are listed according to their frequencies. After selecting an event, the distribution window is updated. The window is divided into three sections: On the top are the menu and a combobox from which the rearrangement to be analysed is selected, including little information on that event. The viewing panel below is divided into two parts: The upper viewing panel shows the number of karyotypes with a given number of rearrangements. The x-axis stands for the number of rearrangements encountered in a karyotype, and the y-axis for the number of karyotypes with that number of aberrations. Blue color denoted all karyotypes, while red color denotes karyotypes with the selected rearrangement. The lower viewing panel compares the number of karyotypes with the selected event to the expected number of karyotypes with the event. The expected number is calculated in a complicated fashion. As above, the x-axis stands for the number of aberrations per karyotype, and is in parallel with the upper viewing panel. The y-axis denotes the difference between the expected and the observed number of karyotypes with the selected aberration. Moving the mouse over the figure will show up information on the respective point. 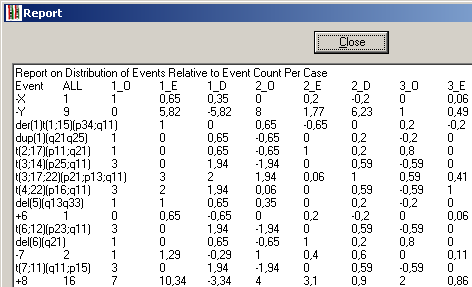 In the example above, event i(17)(q10) was selected. It was encountered in 7 karyotypes. It was not found in karyotypes with 1 aberration only (i.e. it was never found alone). In karyotypes with 2 aberrations, it was found 5 times among the 32 cases. It was expected to be found in 1.38 karyotypes with exactly two aberrations, hence it was encountered 3.62 times more often than expected. Such a rearrangement can be interpreted as a secondary event in tumour progression. The "Save" menu allows you to save the graphic which is displayed in the viewer panel into an image file. Regrettably, the imagemap information gets lost during that process. "Graphics" starts the calculation of the distribution and selects the first event in the combobox, save when no recalculation is required. "Report" will display a textual report on the data behind the aberration count distribution. For better viewing, it can simply be copied into a spread sheet (e.g. Microsoft Excel). In the left column, the rearrangement is denoted. Next follows the number of karyotypes with the specified rearrangement. There after, for each number of rearrangements per karyotype the observed number ("_O"), expected number ("_E"), and their difference ("_D") is given. The parameters for the dependence network can be accessed from the "Edit" menu. Both submenus will open the same edit window, but with the appriopriate tab selected. Editing the parameters via this menu will change the parameters for subsequent calculations of this window only. For the meaning of the parameters of the dependence netowrk see below. 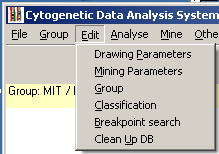 The General Parameters are explained in the Data Mining page. The distribution parameters can be accessed from the "Edit" menu. Both submenus will open the same edit window, but with the appriopriate tab selected. Editing the parameters via this menu will change the parameters for subsequent calculations of this window only. Alternatively, the parameters can be accessed from the CyDAS main window using the "Edit - Mining Parameters" menu. Changing the parameters from the main window will influence all mining windows opened later. The number of events displayed on the viewing panel can be adjusted by the user with the left track bar. 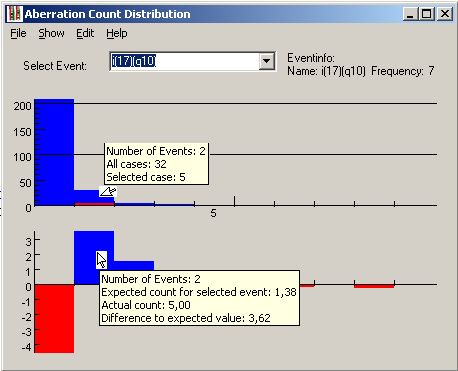 By default, the user can see between 5 and 15 events. It is not recommended to use very high maximum values, since also quite rare rearrangements would be shown. There is no minimum requirement for the frequency of an event to be shown - it might have occured once only. Too small a number might hide remarkable associations. The dependence of two rearrangements is depicted as a line between the rearrangements. In order to get a usefult overview of important associations, a high reliability (as measured by the (non-signed) chi-square value) of the associations is requested. The user can adjust the value which is required as a minimum with the right track bar. By default, the minimum value is 1 and the maximum value is 10. Allowing a minimum of 0 can be useful, if statistical information for all "associations" is to be queried, also for those which are not at all statistically significant. This cannot be recommended with a high number of events shown. Allowing very high requirements for chi-square can be useful when very large numbers of karyotypes were analysed. More background information on the algorithms used for calculating the distribution can be found in the technical documentation for the Miner class.